A virtual evolution in IT shops large and small has begun. VMware’s ESX Server is the enterprise tool to free your infrastructure from its physical limitations providing the great transformation into a virtual environment--this book shows you how. 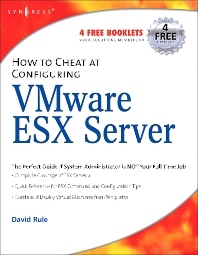 Use Syngress’ proven “How to Cheat” methodology to configure and build VMware’s ESX Server version 3. This clear, concise guide provides all the information you need to become a virtual whiz! This book will detail the default and custom installation of VMware’s ESX server as well as basic and advanced virtual machine configurations. It will then walk the reader through post installation configurations including installation and configuration of VirtualCenter. From here, readers will learn to efficiently create and deploy virtual machine templates. Best practices for securing and backing up your virtual environment are also provided. The book concludes with a series of handy, time-saving command and configuration for: bash shell keystrokes, Linux commands, configuration files, common/proc files, VMware ESX commands, and troubleshooting. • Reap the Benefits of Server Virtualization Realize improved ROI, ensure efficient mergers and acquisitions, and reduce compliance risk exposure through server virtualization and consolidation. • Build a Virtual Machine Create a Gold Master and use your VMlibrary to leverage the power and flexibility of VMware. • Manage Your Virtual Infrastructure Use VMware tools to partition physical servers and manage virtual machines. • Set Up Scripted Installation See how a scripted installation method can be a fast and efficient way to provision ESX hosts. • Master ESX Native Tools Use tools like Esxtop to diagnose performance issues and vmkfstools to import and export • Install and Use VMware Scripting APIs Develop programs to help automate and ease administration—even with a limited background in scripting or programming. • Learn the Fundamentals of a VM Backup VMware ESX ships with three scripts that work together to create a backup and restore system: vmsnap.pl, vmsnap_all.pl, and vmres.pl. • Extend a Cloned Windows VM’s Root Partition Use Microsoft’s Sysprep utility to extend a newly deployed virtual machine’s root partition from the original clone size to a larger size. David Rule Jr. (VMware VCP, VAC, MCP, Citrix CCEA, CCA) is a Senior Consultant for Choice Solutions LLC, an Overland Park, KS-based systems integrator that provides IT design, project management, and support for enterprise computing systems. David’s primary role is in developing virtualization strategies for Choice Solutions’ clients. VMware VCP, VAC, MCP, Citrix CCEA, CCA and Senior Consultant, Choice Solutions LLC, Overland Park, KS, U.S.A.